The Open Knowledge Festival 2014 will take place at the Kulturbrauerei in Berlin. 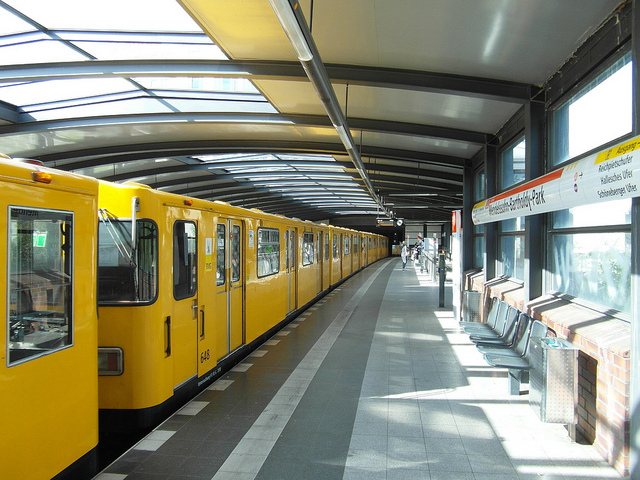 Public transport: TXL bus to Alexanderplatz + U2 U-Bahn train to Eberswalderstrasse. From there it’s a 5 minute walk. Public transport: S-Bahn train to Schönhauser Allee + U2 U-Bahn train to Eberswalderstrasse. From there it’s a 5 minute walk. The closest U-Bahn station to the Kulturbrauerei is Eberswalder Straße. The U2 line operates here. The closest Tram station is also Eberswalder Straße. You can take the M12, M1 or M10. Below you’ll find some accommodation options, all close to the venue, sorted by price from cheapest to most expensive. A map is coming soon! The Catalonia Berlin Mitte is the preferred hotel partner of OKFestival and we’ve negotiated special rates for conference attendees. Centrally located in the heart of downtown Berlin, the Catalonia Berlin Mitte is the ideal location to take in all that OKFestival and Berlin have to offer. To take advantage of the special offer please contact [email protected]hoteles-catalonia.es or +49 (0)30 24084770 quoting the code ‘’Open Knowledge 2014’. The Hotel4Youth am Mauerpark is located on the former border stripe of the Berlin Wall, right in the opposite of the legendary and famous Mauerpark. The hotel offers fresh and modern comfort for the stay. Get close to exciting history! Eastside Pension offers city lovers and business people alike a nice and comfortable accommodation. Their bike rental shop “Lila Bike” is located in the same building. The Wombats CITY HOSTEL is a comfortable and popular backpacker hostel: a unique convergence of hotel and youth hostel, at which many facilities are shared among guests. The comfy lounge, the womBar on the rooftop with the view on Alexanderplatz and the guest kitchen are shared. Schall und Rauch offers completely renovated rooms that tell a history of man than 100 years. The rooms are lovely decorated and Schall und Rauch is located in a quiet area of Prenzlauer Berg. Connected to the hotel one will find the highly frequented restaurant of Schall und Rauch, that provides breakfast, a weekly menue and fine wines. Hotel Transit Loft is a modern hotel in an old factory. The yellow-brick, late 19th century building was modernised in 2001: Five floors offering a variety of leisure activities. The 47 rooms (1–5 beds) are bright, comfortable and functionally furnished. citystay Hostel is located close to Hackescher Markt and the Museumsinsel. To easily discover the city, the hostel has its own bike rental and provides an all-you-can-eat-and-drink Breakfast buffet (4,80 €) that is certified from organic manufacturers. The Circus Hostel is located in Prenzlauer Berg and provides cozy rooms, a David Hasselhoff Shrine and an Art Box. The hostel also offers free underground tours and DIY Walking Tours. Pfefferbett Hostel Berlin is a quiet hostel where the guests have a courtyard or a garden outside their window. Just around the hostel’s corner is Kastanienallee, a very popular street with plenty of coffee shops, bars, restaurants and shops. The MEININGER Hotel Berlin Prenzlauer Berg is a hotspot for international travellers. It offers pool and table football, Wii and karaoke and has also a guest kitchen where guests can cook their own food. The Eastseven Hostels fairly small size creates a low-key atmosphere and fosters a relaxed atmosphere where it’s easy to chat to the staff or make friends in the lounge, kitchen or in the cosy garden of the Hostel. Eastseven is located between the hustle and bustle of Berlin Mitte (the city’s central district) and charming Prenzlauer Berg. Berlin Home offers comfortable apartments for 1 to 6 persons. All apartments are furnished and located in the best areas of Prenzlauer Berg, where one will find all the famous spots like Kastanienallee, Kollwitzplatz or Mauerpark just in front of your door. Lux 11 is a luxury hotel in Berlin-Mitte created to welcome global travelers, whether it is their first or tenth time in Berlin. The hotel has its own urban Berlin style and individuality, which makes it the ideal place for trendy, independent travellers. Soho House Berlin is a private members’ club with 65 rooms, 20 fully serviced apartments and 4 spacious lofts. Set over eight floors of a restored Bauhaus building in the Mitte district, Soho House Berlin includes a Cowshed Spa and gym, a rooftop pool, restaurants, bars, a screening room and private Event spaces. The Weinmeister Hotel in Berlin-Mitte is a design hotel in Berlin with 84 rooms that aimes at business travellers from the film, music, fashion and other creative fields, as well as leisure travellers. Instead of TVs, each room is equipped with Apple iMacs which opens up an opportunity to the guests to explore the modern vibe of the hotel and the high technology it has to offer. Linnen is a modern boutique-style “inn” with a lovely on-site café: more home, less hotel. In addition to 6 individually-styled rooms, they offer a separate three-room apartment in the same building. This list doesn’t aim to be exhaustive – Berlin can offer plenty of accommodation solutions for any budget! To explore further options, we recommend you to check also on AirBnb (private and shared apartments), Be My Guest Berlin(private and shared apartments) and Booking.com (pensions and hotels).